My idea of what retail banking should be like is heavily coloured by my first experiences of it. 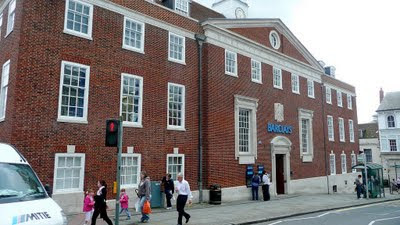 I opened an account at Barclays* in Winchester when I was about 13 and had just gone to school there and a small amount of money was deposited in my account by my parents and occasionally topped up. I didn't need much; just enough to go the school shop a couple of times a week for egg and chips (2/6p) to supplement the appalling food that Francis King served in Phil's. Other things were bought on my mother Annette's account - groceries at Cullen's in Jewry St and books at Harrington's in Parchment St. Later we used to go to the Two Bare Feet coffee bar (also in Parchment St) and have weak cappucinos in glass cups and saucers and imagine that we were cool. As a consequence, I went rarely to the bank (these were the days long before cash machines) to draw out money, but when I did, one entered the rather splendid high-ceiling banking hall and I sought out Carol, an absolutely stunning blonde cashier, who always cashed my £5 cheques with a smile and later some banter. Not infrequently, the manager of the bank, George Corse, would come out of his office beside the cashiers' desks and talk to me. It was then customary for the manager to try meet his customers as often as he could, and I would often see him on the floor of the bank just chatting to people as they came in. He invited me to play golf and on one occasion gave me lunch at the Georgian Restaurant in Jewry St. In time he used to tease me about Carol, and even much later when he had long retired and I met him on the street, he would remind me of her and my £5 cheques. Sadly I suspect Carol didn't heed Stendhal's advice to beautiful women. But George Corse's bonhomie, humility and customer care could provide a useful lesson to bankers today. * Above the banking hall were offices where the secretarial school of Miss VM Sprules and MIss A Glyka could be found. Several of my friends attended.